What follows is a bit of the background I have hammered out so far and reports of the first two actions of the campaign. Positioned just on the wrong side of the Cicatrix Malledictum, Xoxigar has felt the light of the Emperor diminish in recent times, though not so much as to be completely forgotten. The Xoxigar system has three inhabited planets. So-named because it was the first of the planets in the system to be colonized. Xoxigar Prime was colonized by humans millennia before the rise of the Emperor during the Age of Technology. At the time it was a originally colonized Xoxigar Prime was temperate world, lush with vegetation and native fauna. Over the last 25,000 years, however, the star at the center of the Xoxigar system has diminished and cooled considerably, leaving Primus now outside of the temperate zone. Now it is a lifeless, frozen rock. The only inhabitants are the crew of a few disparate imperial stations and outposts and the last stronghold of the knight household which once ruled the world. Once a great and mightly household that ruled over Xoxigar Prime for Millennia. After being brought back into the Imperial fold they served the Emperor in many conflicts across the subsector, but has been in steady decline over the centuries. Now all that remains of the once mighty house are the Lady, her consort, two children, and a couple hundred servants, labourers, and support staff. Xoxigar Secondus was the first of the system’s planets colonized by the Imperium after it was brought back into the fold during the Great Crusade. The Adeptus Mechanicus settled it for its rich mineral and promethium reserves. 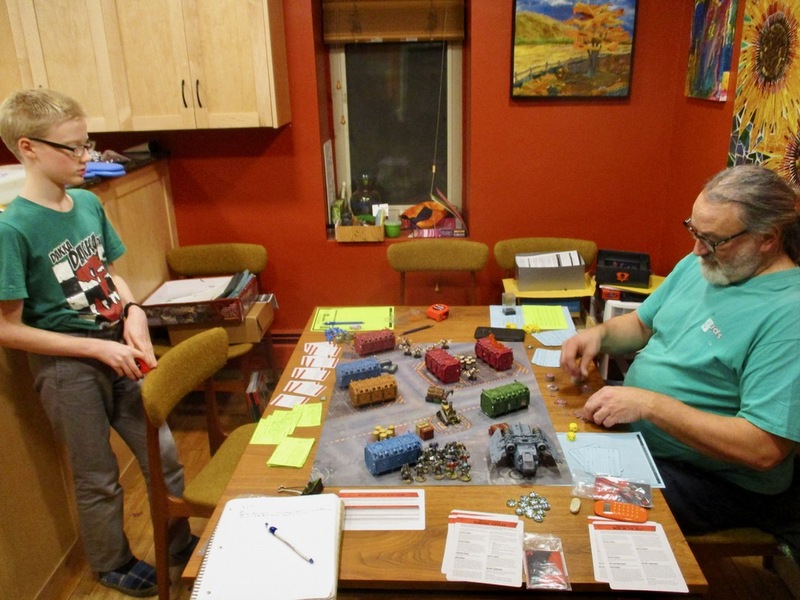 It eventually became a Forge World. Many of the wretched, starving inhabitants from Xoxigar Prime were relocated here to provide indentured labourers to help build the initial settlements. Millenia of heavy industry and strip mining has left most of the planet surface desertified brownfield between the industrial facilities and hab-complexes. What little food is made locally is grown in expansive green houses or cultured in giant vats. Most food comes from Xoxigar Tertium. Xoxigar Tertium was uninhabitable when humans first came to the system – the planet was shrouded dense swirling clouds – Nearly all of the water on the planet was vapour due to the intense heat. As the star cooled over the millennia more liquid water was able to form on the surface and in a few short millennia (with the aid of a Departmento Munitorum seeding program) the planet was teeming with life. When it had cooled sufficiently for human habitation, the planet was colonized in hopes that it would become an Agriworld. The growing conditions are superb throughout the planet, but optimal production has never been reached as the jungle constantly grows band and has to be cut back regularly. Gais Norvus is the current Imperial Commander. The title is hereditary and the family has ruled over Xoxigar Tertium for hundreds of years. In the for over 20 years Xoxigar Tertium has suffered a brutal civil war. A number of cities and declared themselves independent of the rule of Gais Norvus and the Imperium. 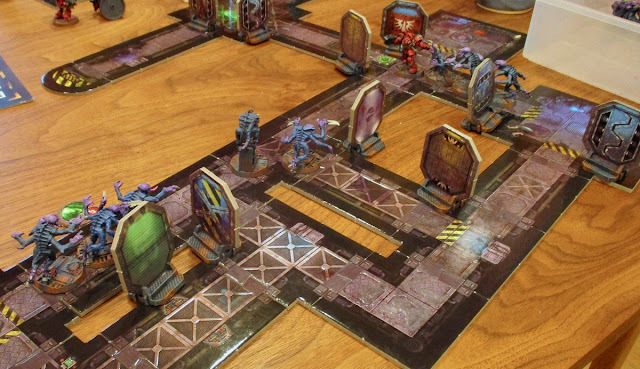 Norvus has used the Planetary Defence Forces to try and retake the break-away cities. 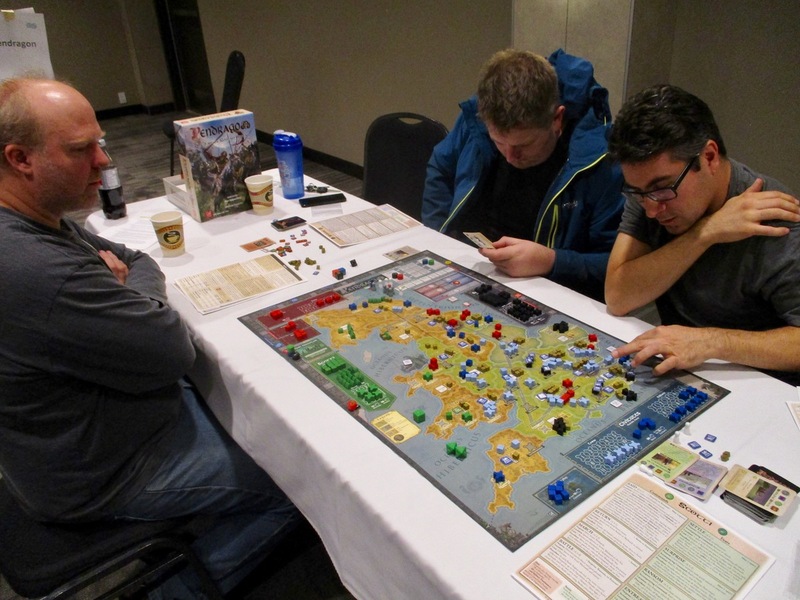 Secessionists and Loyalists have clashed in bloody battle across the world, leaving cities in heaping ruins and fields burning – ripe to be retaken by the creeping jungle. 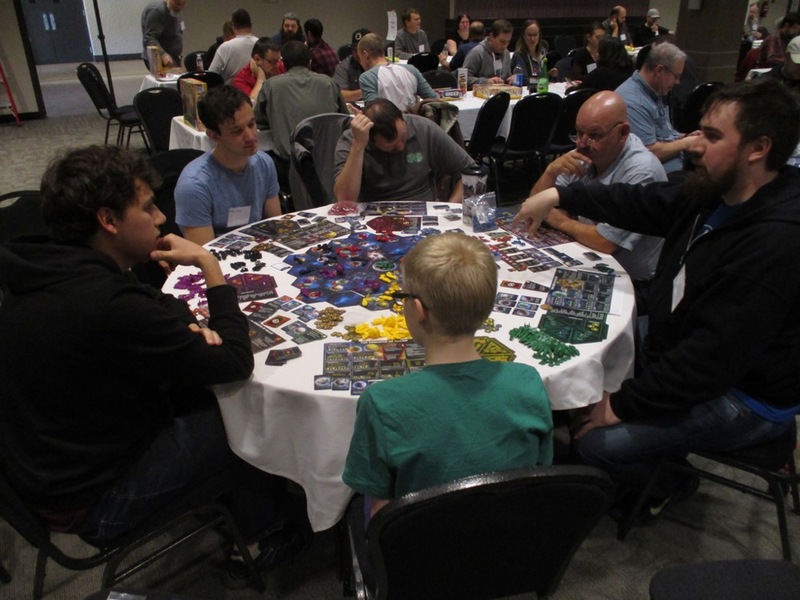 For the longest time the Imperium took no notice of Xoxigar Tertium’s troubles, as Departmento Munitorum tithes were met, and the Imperial Commander did not request help (Commander Norvus was no doubt concerned that a request for aid would make him seem weak or he could be seen as incompetent and replaced). 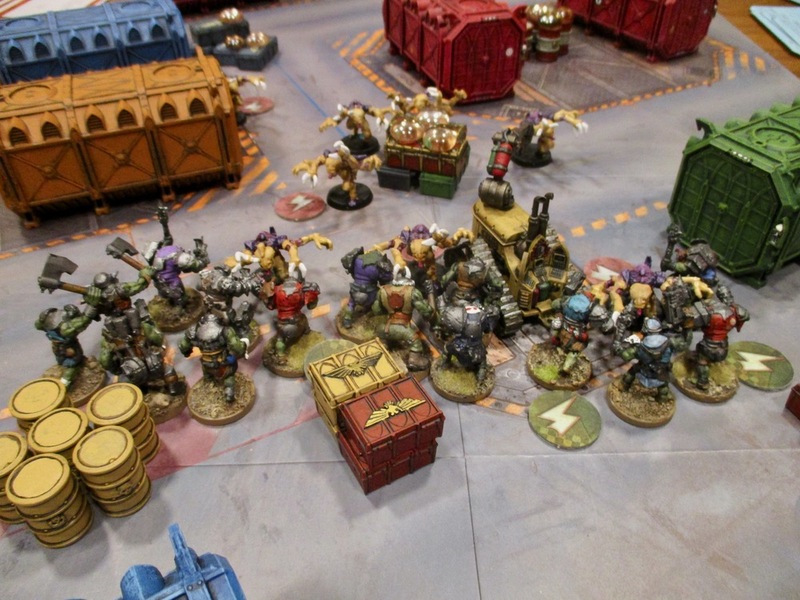 But as the war ground on, and with the arrival of the Orks (and other factions), production on the planet has been severely impeded and THAT has made the Departmento Munitorum take notice. 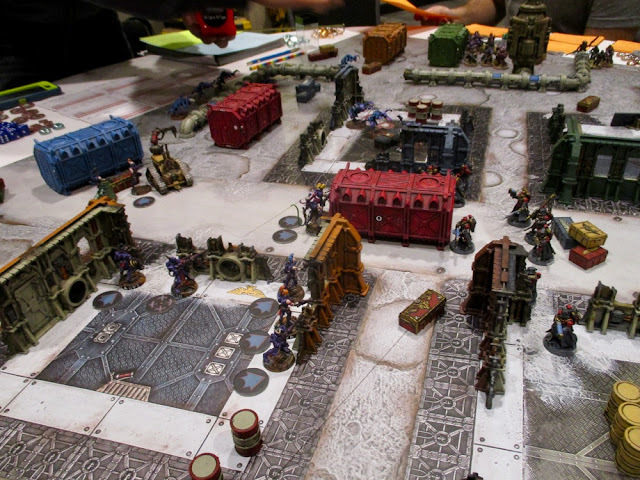 A number of Imperial Guard Regiments have been deployed to the war zone so far. 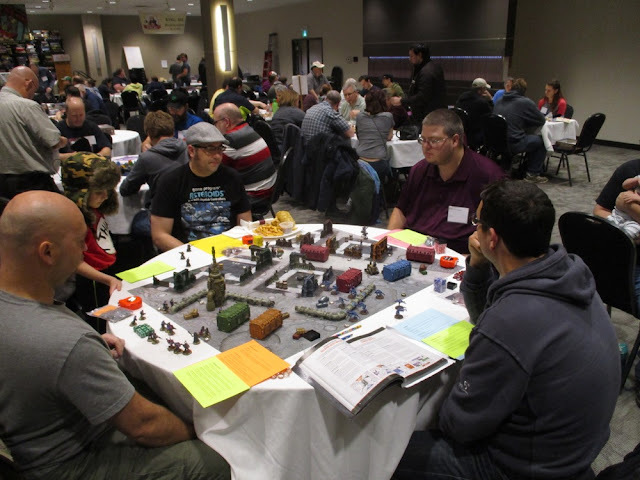 So far the conflict hasn’t been deemed serious enough to require intervention of the Adeptus Astartes. The 275/341st Valhallan regiment is an amalgamated regiment – originally the 275th Valhallan Infantry Regiment and the 341st Valhallan Armoured Regiment. The two regiments have served together for nigh two decades over countless war zones. They have both been greatly reduced in strength over the years. The Infantry regiment, once ten thousand strong, has been reduced to a couple of understrength companies of less than 200 each. The Armoured component, once boasted over twenty companies of battle tanks plus reconnaissance and support vehicles, is now reduced to a single, under-strength company of a half-dozen or so tanks and a few support vehicles. Many regiments so reduced make up for their lack of numbers by being the hardest, bravest veterans. Not so the 275/341st. All that remains of the respective regiments are the basest of survivors, cowardly wretches and invalids. 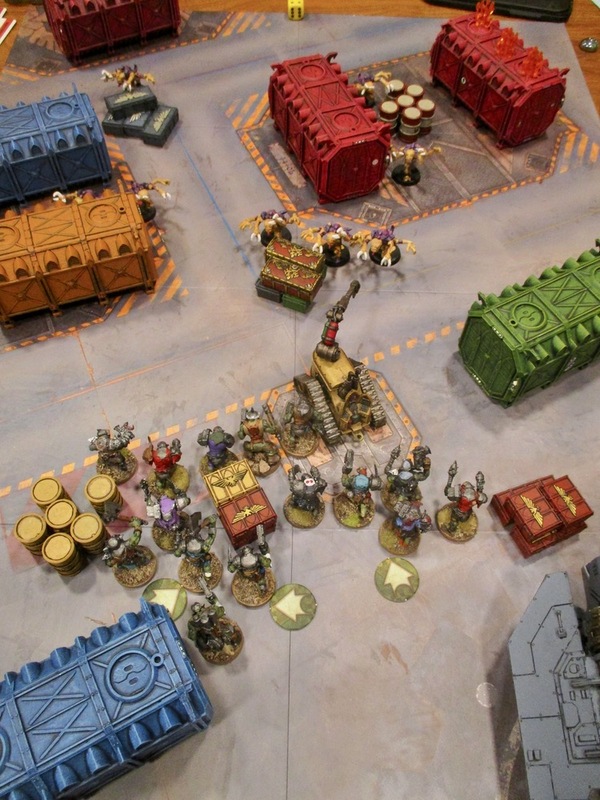 The combined regiment has been deployed to Xoxigar Prime as a small reserve and to provide protection for the few small imperial outposts on the world, should the conflict spread this far. 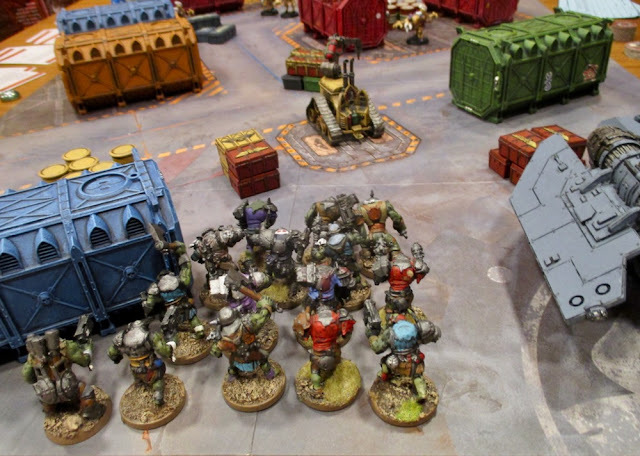 A small army group of Tallarn have been deployed to Xoxigar Secondus to bolster the Mechanicus Skitarri legions and help with rooting out the Ork infestation and protecting the Imperium’s valuable installations and factoriums. Included in the force are the 382nd Tallarn (Desert Raider) Regiment and the 451st Tallarn Tank Regiment, who recently served together on Brind’s World, as well as the 17th Tallarn Super Heavy Tank Regiment with its Shadowswords and Baneblades. The 222nd Guaiacan Commando Regiment, which also recently saw action on Brind’s World, has been deployed to the jungles of Xoxigar Tertium – where they are in their element! Orks entered the system a dozen years ago aboard a couple of roks and a pair of Attack Ships. The Attack Ships were destroyed by Imperial Navy ships that happened to be in system at the time, but not before the roks detonated in orbit around Xoxigar Secondus and Tertium, showering both planets with meteorid entry vehicles. On Xoxigar Secondus only a few survived planetfall and have formed small groups of raiding parties that strike out of the desert and attack isolated outposts in less-well-inhabited regions. Rumours have been floating about telling of Genestealers in the forests of Xoxigar Tertium. This could be the vanguard of an unknown Hive Fleet that arrived in some sort of reconnaissance bio-pod. If the rumours are true, the Imperial forces need to quickly locate and annihilate this threat. Who can know the mind or reasons of the perfidious Aeldari? Rumoured sightings of different varieties of Aeldari have also arisen, what reason could THEY have for bring in the Xoxigar system, so far from any known craftworlds? 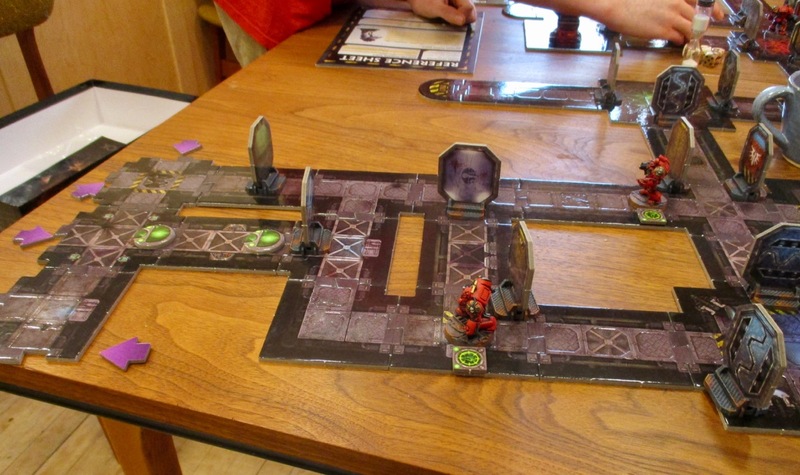 This past Friday we played the first few games of our Kill Team capaing set in the Xoxigar system. The Skirmishes involved two groups of Aeldari meeting in the dense jungles of Xoxigar Tertium and Raiding parties of Orks and Genestealers bumping into each other on the field of a remote Munitorum facility! 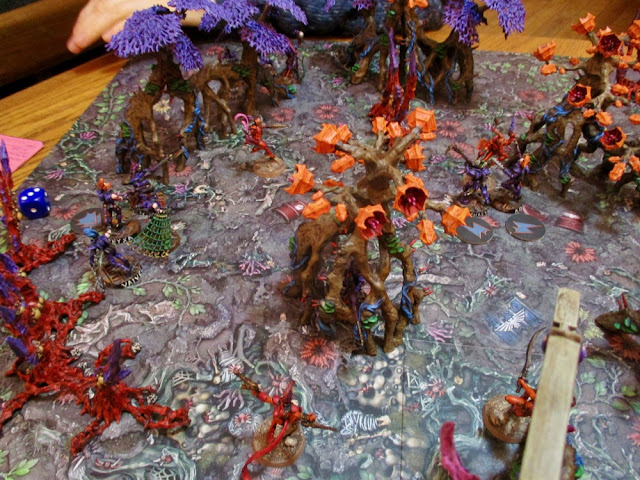 Amanda and The Girl decided to battle it out in the Deathworld-like forests of Xoxigar Tertium. It is yet unclear exactly why either force was there, but they bumped into each other and as the first shots rang out – the forest turned against them! The scenario they played was Make Your Escape! 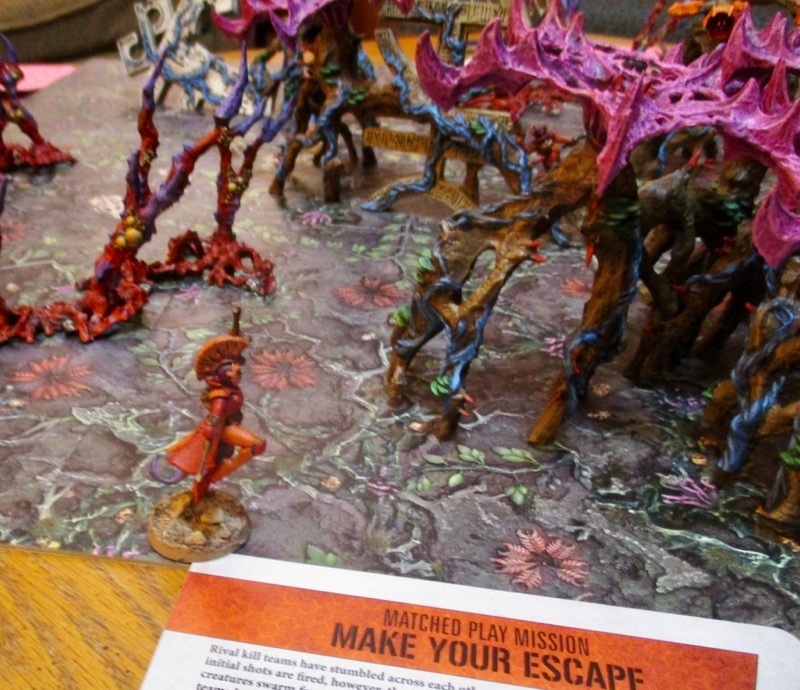 This was one of the scenarios that came with the Deathworld Forest Killzone box. 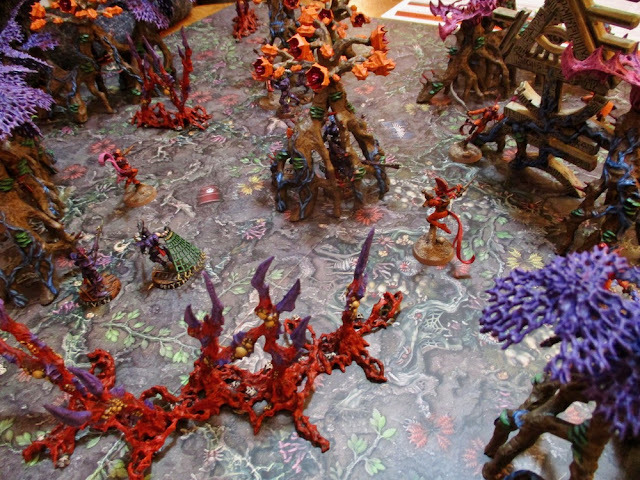 Essentially two teams meet each other in the forest and as the first shots ring out they are attacked by the forset ("Swarms of Murder Bees!" said The Girl). NO scouting phase, deployment is a bit different; both sides deploy one figure at a time, anywhere - as long as it is not within 3" of an enemy or within 6" of the table edge. After deployment each side determines a random edge that they need to escape from. 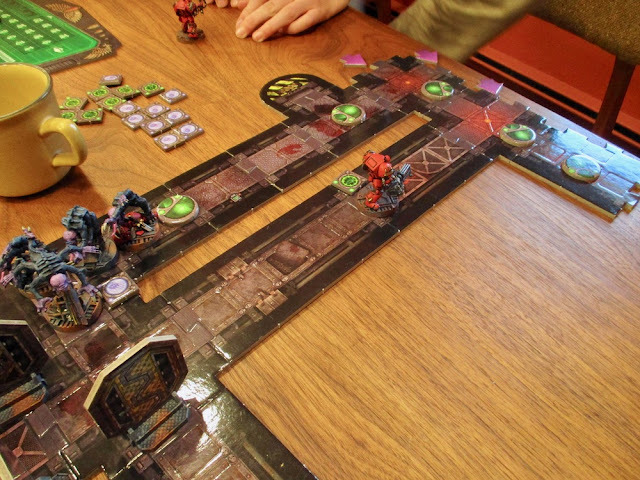 Each side gains one victory point for each member of their Kill Team that escapes and loses one for each member out of action or left on the table at the end of the game. With lower numbers the Harlequins were going to have a tough go at it. 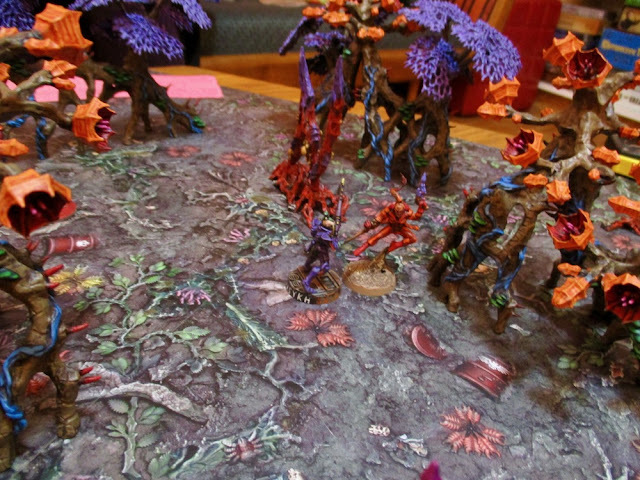 If both sides simply ran off the table, they would lose because the numbers the Drukhari had would give them more points. Thus they HAD to engage the Drukhari, take at least a few of them out, AND escape off the table before all the Drukhari - or on the same turn the last Drukhari to have a hope of winning. Most of the Drukhari set up in one big bunch more or less in the middle of the table - though slightly off towards one of the corners - Amanda hedging her bets that she would roll ONE of the two sides she was slightly closer to as the edge she needs to escape from. The Harlequins set up all around the board. Another Drukhari was taken out of action... by the forest! 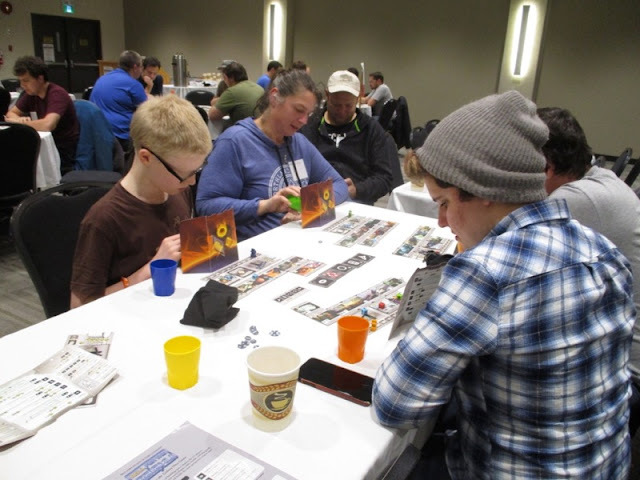 But five managed to successfully run off the table (we realized much later that Amanda hadn't been using an extra die and taking the lowest... oops...). The Harlequin Troupe Leader also took a flesh wound from the terrain and decided to high tail it out of there! The Harelquin Combat and Zealot specialists FINALLY managed to charge into combat against one of their foes - Thrixxesh Xosh, The Dark Lance toting, Drukhari sniper specialist - and took her DOWN! By the end of the round the only Drukhari left on the table was Saphisykh Vhrex, a Kabalite Warrior, who had survived three rounds of going toe-to-toe with a Harlequin (during the first round I had predicted the Wych that was also in the melee would survive, not the Kabalite!). As the Drukhari already had six off the table, and had lost only three so far, The Girl Realized she'd have to keep the Drukhai Kabalite alive long enough for her to get at least two more of her Harlequins off the table (because if she succeeded in killing the lone Kabalite, all Drukhari would be off the table - ending the scenario) before the game ended - she'd have to get all three off if she just let the Drukhari go and everyone just fled to their escape edges... but I think she'd had enough and opted for a strategic withdrawal. The Harlequins ended the game with none out of action, but four had flesh wounds and had to check if they wend out of action after the game - three did, including the leader, the zealot and the combat specialist!! 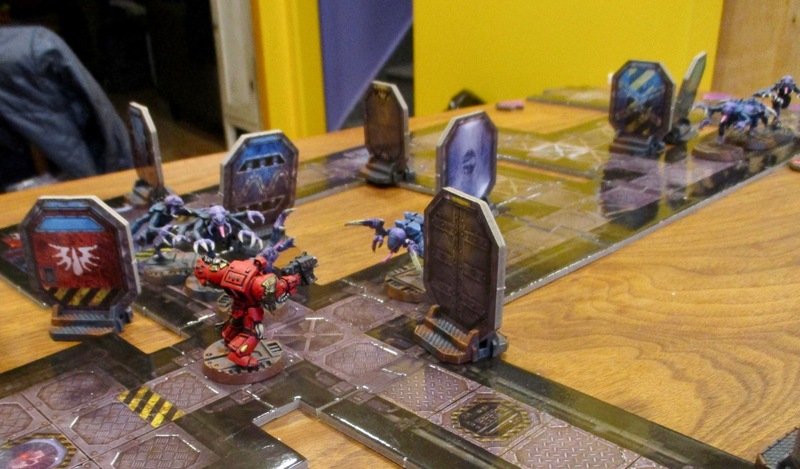 One, the Zealot, ended up convalescing and will have to miss the next game. Another rolled, the Combat Specialist, rolled Hard Knocks and gained a bonus experience point for all her suffering. The Leader was okay. I think everyone got just one experience point, except the Combat Specialist, who got two because of her roll on the injury table. 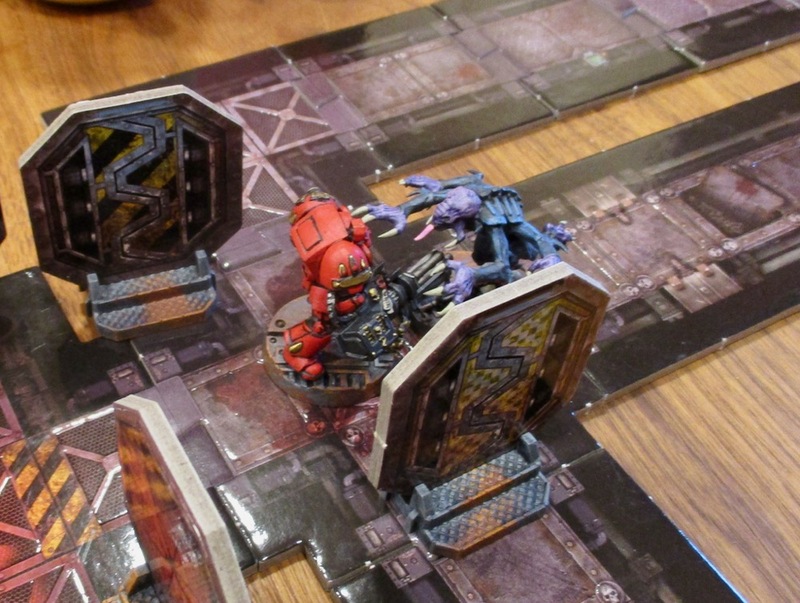 The Harlequins lost one materiel and one morale for their defeat in this scenario. Finnegan and Bruce had a got at it in the Sector Munitorum. They started a bit later - because Bruce had to make his Kill Team (he brought his own models, but doesn't have the rules or anything, so....). Despite that, they went four full rounds and finished before the Grrrlz finished at the end of three!? Finnegan does know the game really well, and Bruce picked it up really quick. 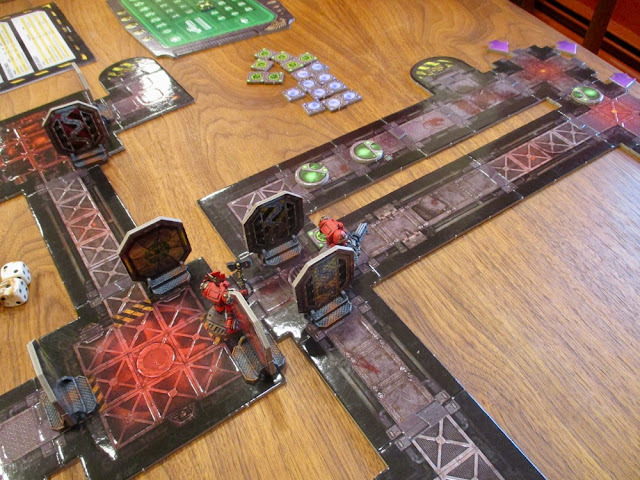 The scenario they played was one from the Sector Munitorum Box - Scavenge Supplies. 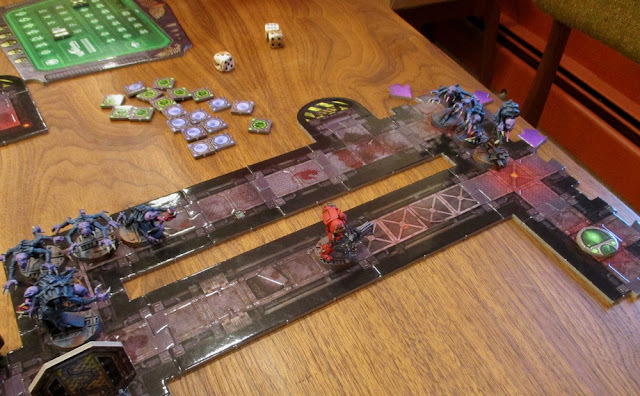 There were five objective markers (the piles of crates and barrels) and at the end of the turn when an unshaken model was within 1" of them the player would roll to see what it was it could be nothing, it could be a "curio" which gained the player 1 victory point immediately and then was no longer considered an objective, it could be some good supplies, which was worth 2 victory points if the objective was held at the end of the game, or it could be some REALLY good supplies, which were worth 3 victory points if the objective was held at the end of the game. 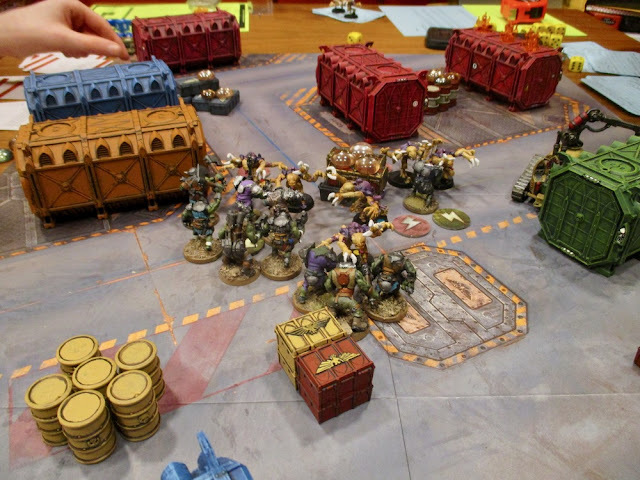 Orks deployed - both sides had a relatively small area in which to deploy - so the Orks really had to pack it in there. 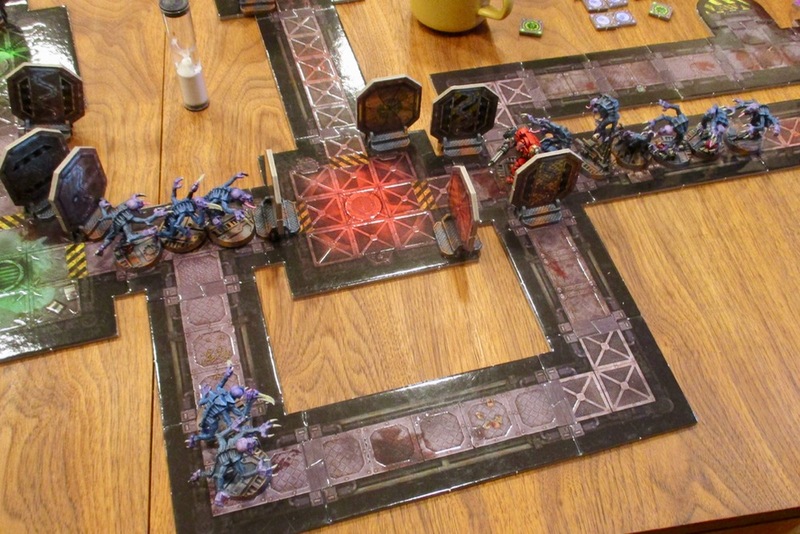 Just after Deployment, the Genestealers got to move a two of their number (because of scouting phase strategy) and the Veteran used it's tactic to move as well. MOVE! All surged forward - I think only three Orks DIDN'T advance - so they could try shooting - which was useless. At the end of the round all objective markers had models within 1" of them so they were checked. Of the two that the Orks were close to, one was worth two victory points if held at the end of the game and the other was a curio that netted the Orks one victory point right then and there. 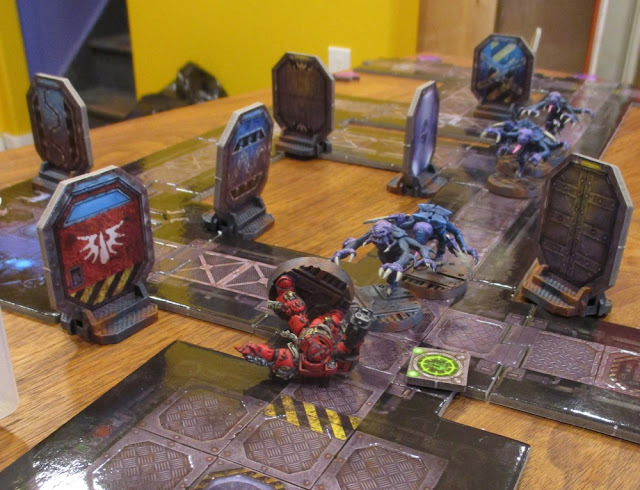 All three of the objectives the Genestealers held were worth THREE victory points if held at the end of the game (that's three sixes Bruce had to roll to get that!). CHARGE! The Genestealers charged a bunch of the Orks, dodging overwatch fire on the way in, then any Orks not engaged charged in against GEnestealers. It was a big bloody mess. 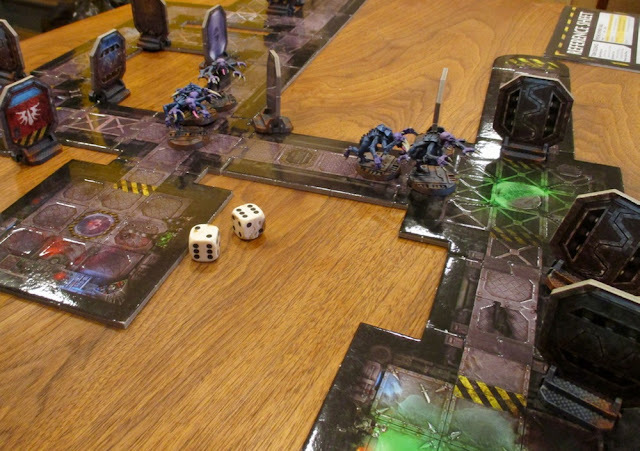 The Orks took out one of the Genestealers, so Bruce used the Caustic Blood tactic (roll a d6 for each enemy within 1" - on a 6 they are dealt one mortal wound)... He took out THREE ORKS with that!! 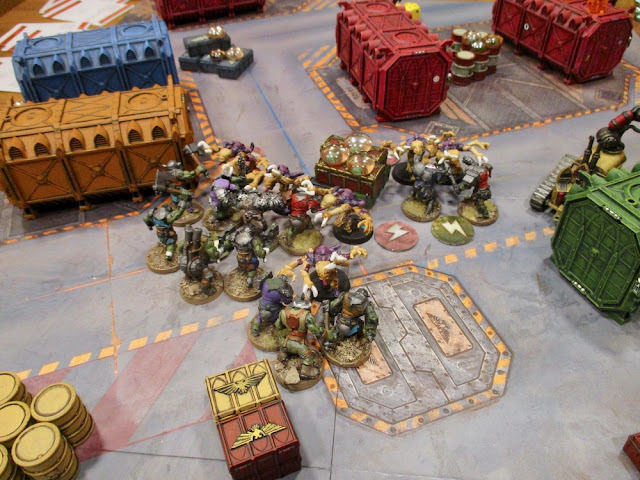 Yellow Ted, the Genestealer veteran, was hit and wounded by three different Orks, but always ended up with just another flesh wound! The Orks actually made use of one of the Special Munitorum Tactics... to move the damned Servo-Hauler out of the way! 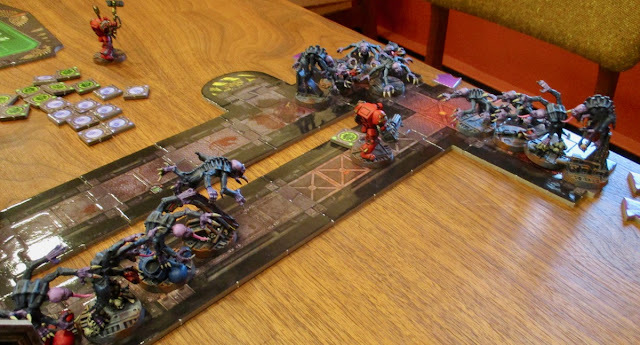 The Orks lost two more, as did the Genestealers. 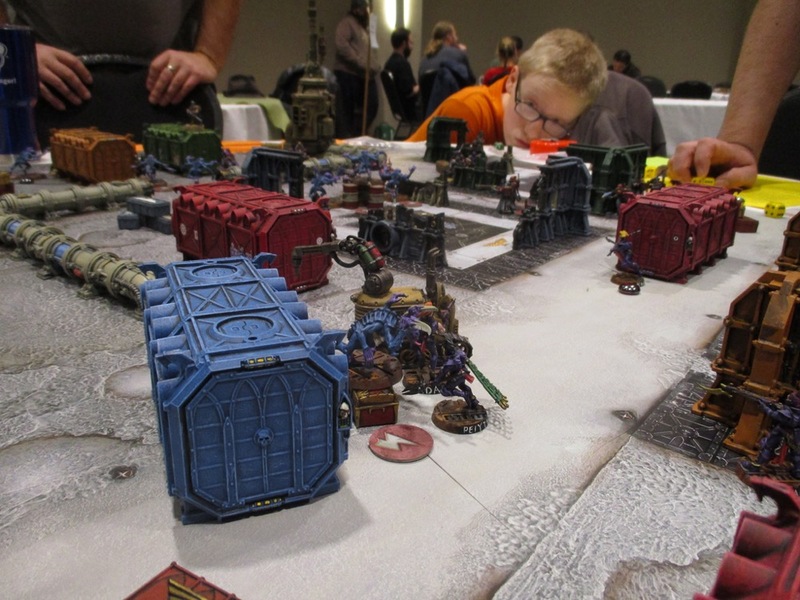 The orks had suffered five losses. All but one turned out to be okay - or well enough to recover and fight in the next battle! Except for poor Rugtug. Rugtug died. It would be replaced by Rugtugger next game... Everyone but the Leader and the Demolitions specialist gained TWO experience points! 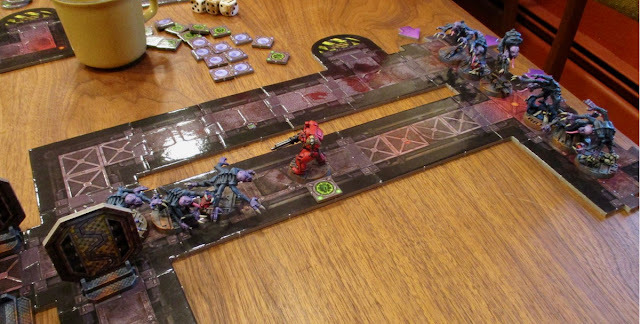 The Genestealers had been tables so everyone had to check for casualties. One died. It was Other Ted. Well, one of them. It will be replaced by New Ted next game. All but the Scout gained two experience points. Blue Ted and Yellow Ted gained two because of rolling Hard Knocks on the injury table - not from using specialist tactics - if they HAD, they'd be levelling up. Maybe next game. The Tyranid force lost 1 intelligence and 1 Morale for their defeat in this game. Well that turned out to be pretty fun. I didn't get a game in, but that's okay. Maybe I'll get one in sometime this week with Amanda or one of the kids. I'm not sure when we'll ALL be playing again (as this coming weekend looks pretty busy), but I'm very much looking forward to it. Things have been going slowly on the painting front. I have a few Adeptus Mechanicus creatures on the workbench that I'm slowly working at, as well as a few Orks for Shadespire. Hopefully I'll finish ONE of those batches up sometime this week and post pictures of them. On Sunday, Finnegan set up a game of Space Hulk for us to play while Amanda and The Girl were out. We had another go at Scenario #3: Exterminate. 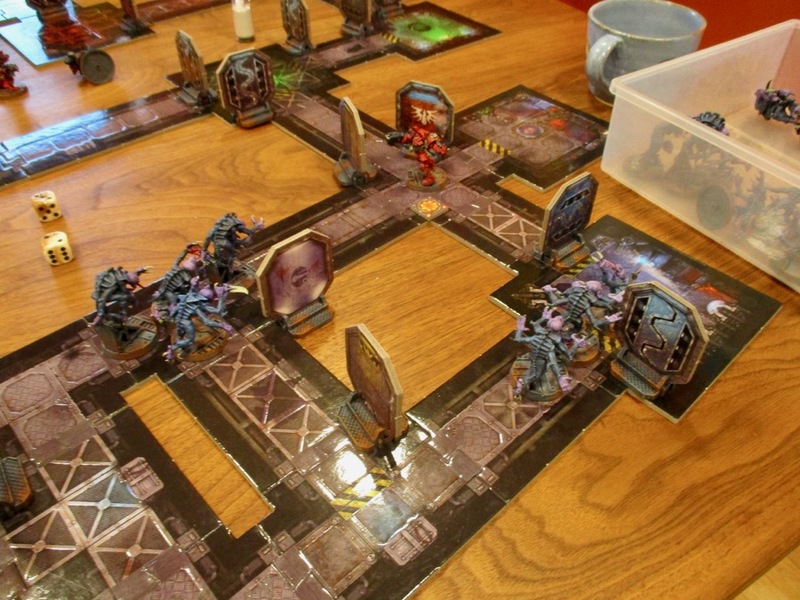 We played this back in August with me playing the Blood Angels Terminators and Finnegan playing the Genestealers. 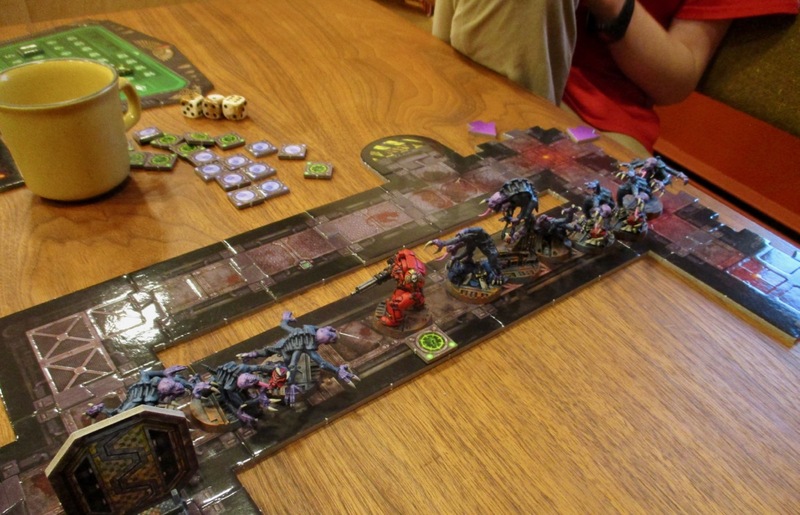 This time we switched things up and I played the Genestealers and he played the Terminators. The Lad getting things set up. 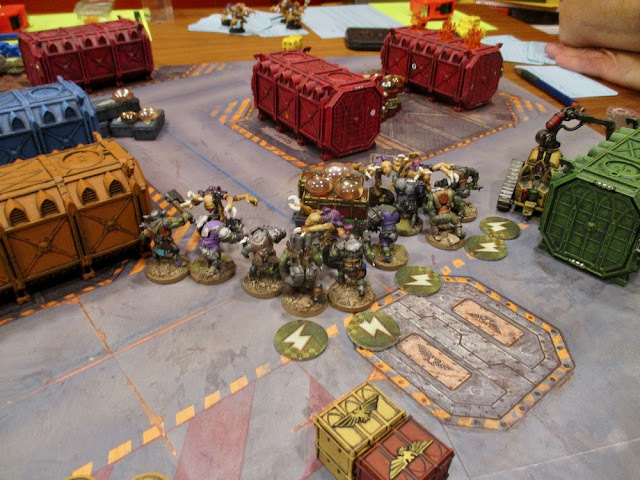 Battle Brothers Scipio and Omnio detect movement in their zone and set up overwatch positions. Sergeant Gideon figures he and Brother Leon have things locked down in their sector and sends Brother Noctis to help Brothers Scipio and Omnio. The Genestealers make their move - Brother Scipio mows them down with his storm bolter! Detecting movement in their sector, Sergeant Gideon and Battle Brother Leon set up defensive positions. "Prepare yourself, Brother! The enemy comes!" Brother Omnio is also taken down just as Brother Noctis arrives. His situation looks dire. 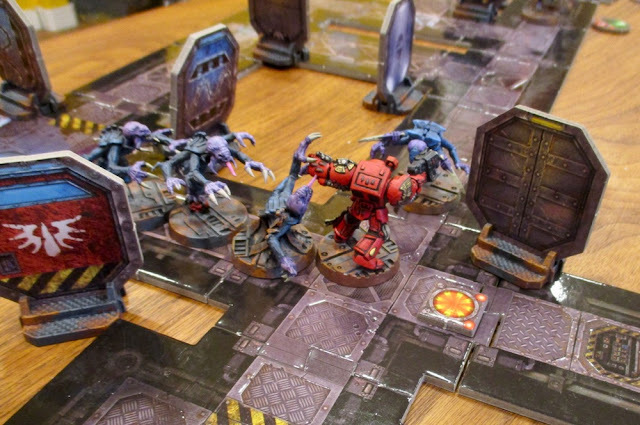 Genestealers coming at Brother Noctis from two directions! Click! Click! Click! Brother Noctis' stormbolter jams!! 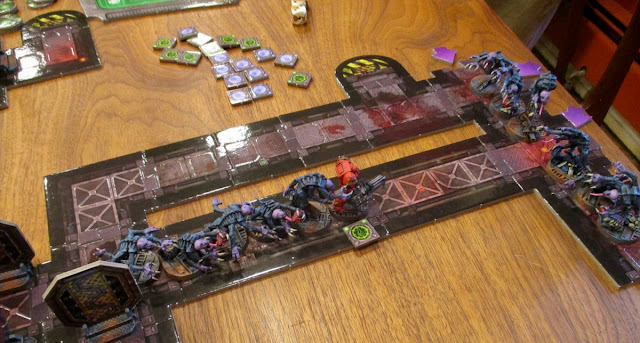 Brother Noctis quickly cleared the jam and tried to back into a room, so as to form a bottleneck through which the Genestealers would have to come at him one at a time. Though he stood his ground bravely and slew many (well... a few...) Genestealers, Brother Noctis was eventually overwhelmed. 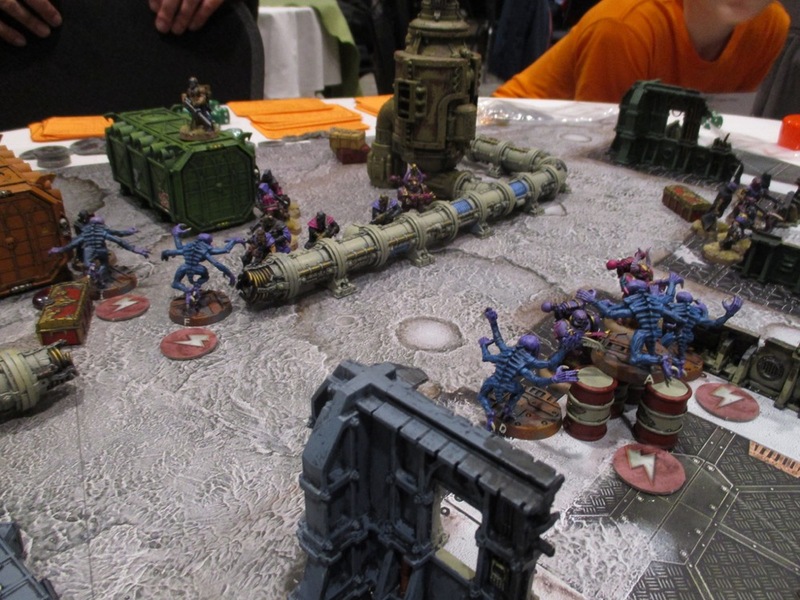 Bother Leon's Assault Cannon Buzzed loudly as it mowed down entire lines of Genestealers. 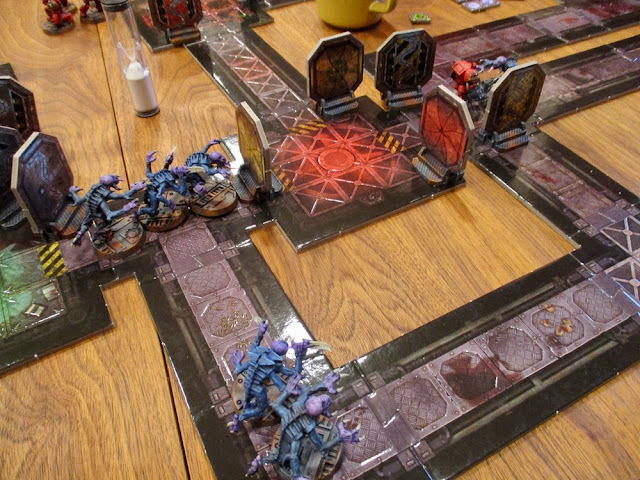 Having finished off Bother Noctis, the remaining Genestealers from that sector start moving up towards Brother Leon. There were more than a few times I thought he was done for, but he just kept mowing down all that stood before him... ! Getting low on ammunition, and the genestealers just keep coming! CLICK! CLICK! CLICK! CLICK! 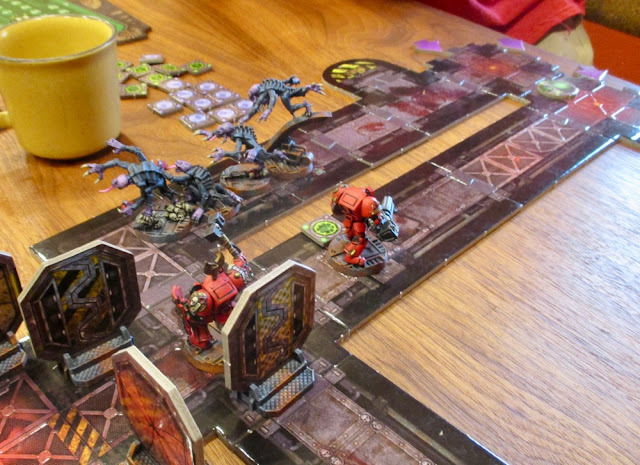 Eventually Brother Leon ran out of ammo for his assault cannon and the Genestealers finally got him!! I think it was Turn Thirteen! 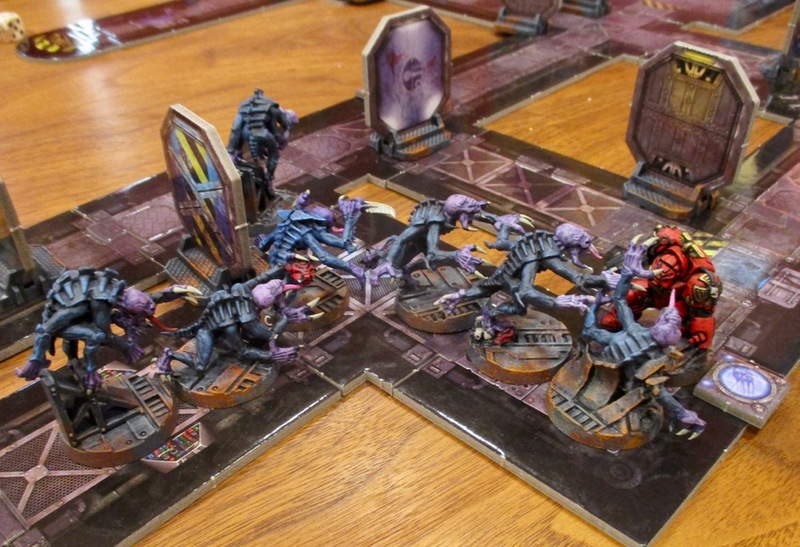 In the game I believe 27 genestealers were killed - and Brother Leon accounted for 18 of those! I had only six left when we finally finished him off! Another hard scenario for the Marines! We have gotten in a few other games - so in a week I'll probably post a report of the other games we've played this month. This past weekend I attended ToonCon with the kids (Amanda would have been there but she was busy dodging hurricanes and alligators in Florida and learning about nap yoga). This is, I think the 8th year the convention has been running, and I've been to... most of them...? 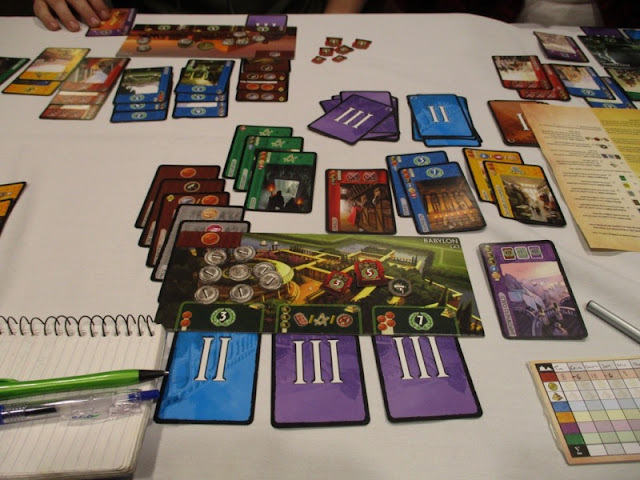 As is our tradition, The Girl and I played 7 wonders. We got in two, seven-player games. The first I was Babylon and did... okay-ish... I didn't really concentrate on any one thing. I think I came in second with 50 or so points. 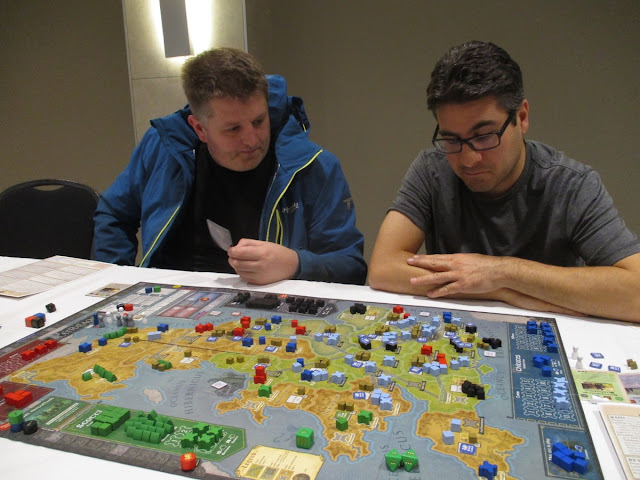 The second game I played Rhodes and went all military and blue buildings, two things I seem to rarely do... and totally crushed it... Maybe I'll have to take this strategy more often in the future! The Girl did pretty good - both time coming in just after me (3rd and 2nd, respectively). I's funny, because everyone remembers her as "That little girl that won 7 wonders a last year" (although it was actually two years ago). 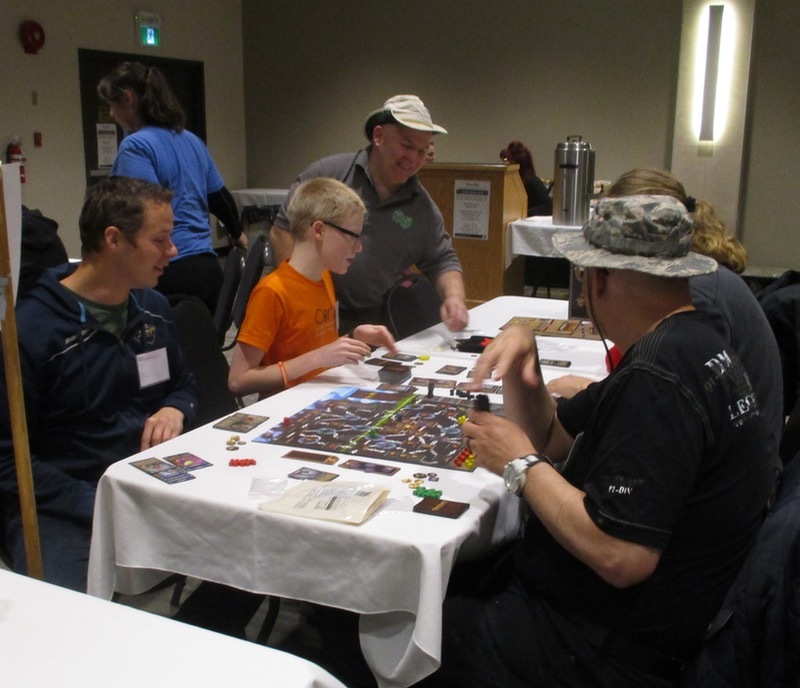 While we were playing 7 wonder, Finnegan was playing Roll for the Galaxy. 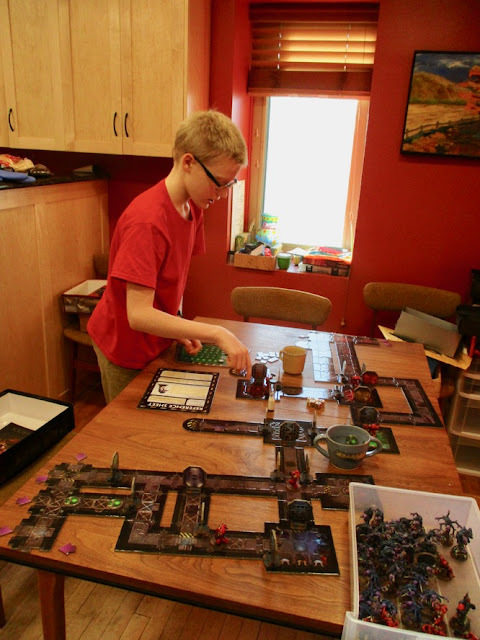 I don't know how he did, but when I popped by to see what was going on, he had a good theme going on, so he was happy (for me this was a HUGE geek dad win - having raised kids that are more interesting in developing an interesting theme or narrative in a game than whether or not they're actually doing well in the game!) 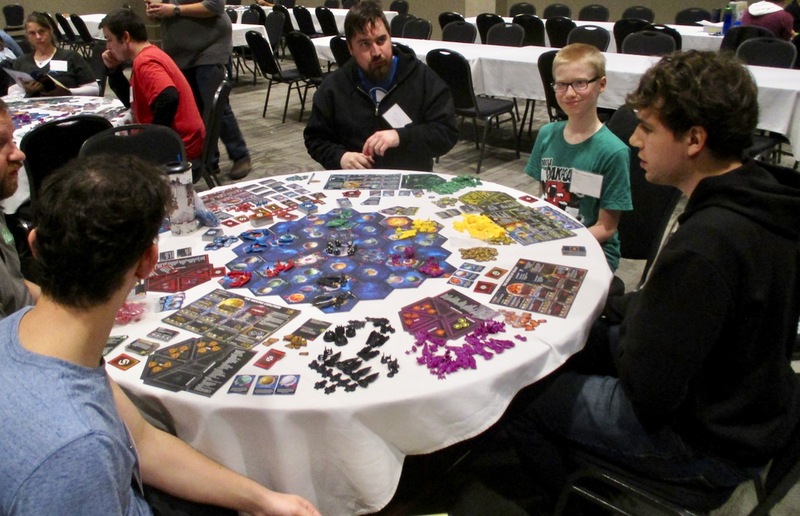 Later he said it was okay, but it mostly just made him want to play RACE for the Galaxy again (which we haven't for some time!). I'm not sure what Finnegan was doing...? 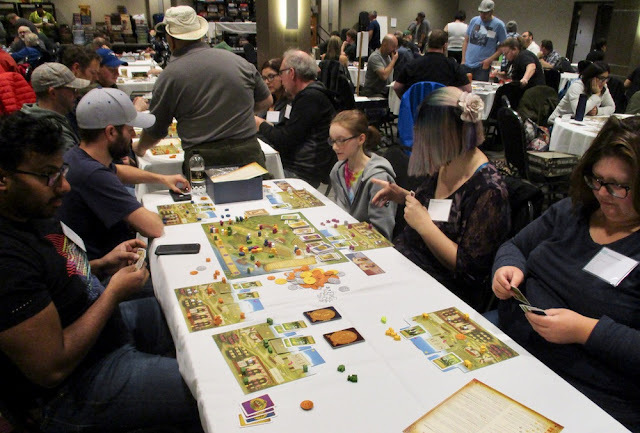 I thought he had signed up for Viticulture? maybe he was at another table? Or maybe he skipped out and went and played something else...? 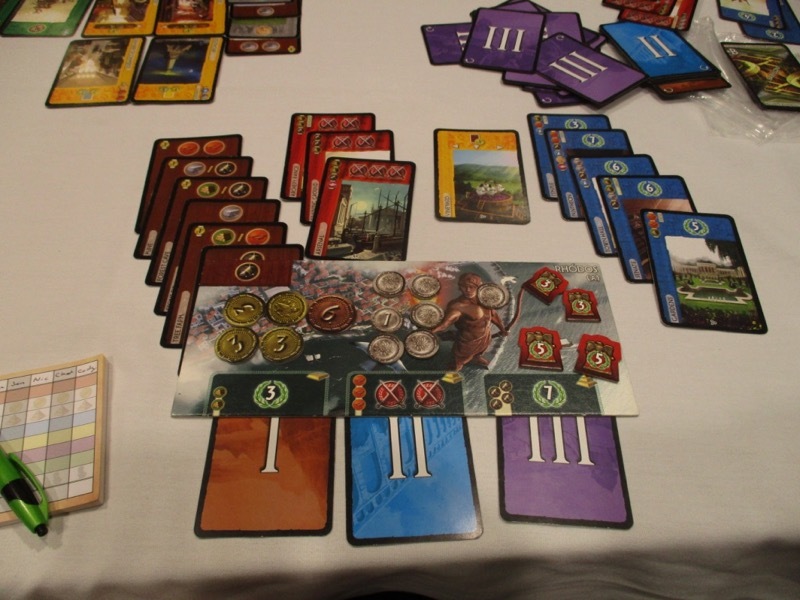 Finally we played a couple games of Century: Spice Road - another game I really enjoy playing - and usually do quite well at. The first game I was ON FIRE! I think I ended with 80-some points, and everyone else was back in the 60s... The second game we had to just stop as it was five to midnight and they were kicking everyone out. 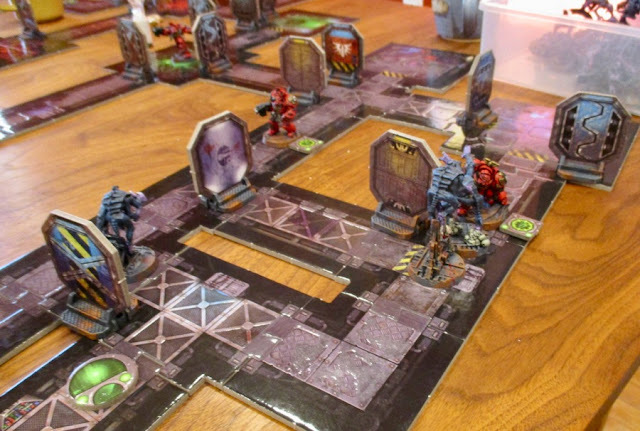 I didn't get a lot of sleep Friday night... for a few reasons... One: I was still getting stuff ready for the Kill Team game I was to run the following afternoon. The Other: when we got home Finnegan's blood-sugar level was CrAzY high!? Like potential-Ketoacidosis-shut-down-organs-dangerously-high!? So I was up for some time just trying to get that down - without it crashing down so low he ended up hypoglycaemic! So Saturday we slept in and skipped the first round of games... I still only ended up with about 5 hours of sleep, but we got there for the second round! The Girl and I were playing Stone Age. I've never played it before. It was a lot of fun. Worker placement in the stone ages - your tribe hunts and gathers food and acquires resources and builds huts... It's funner than it sounds. While we were doing that Finnegan was trying out Clank! After that, I ran my Kill Team game. 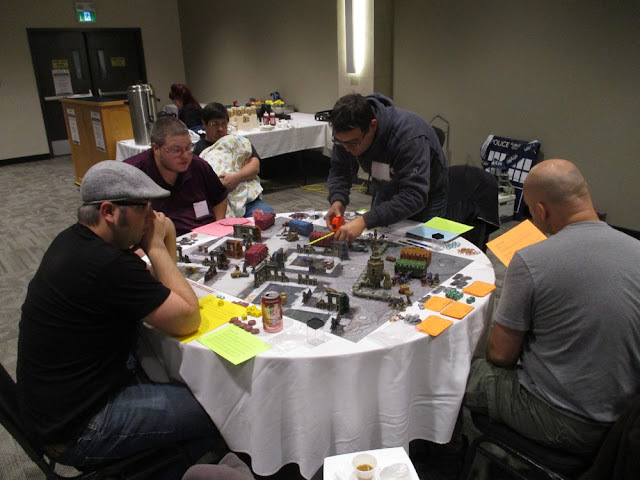 None of the four guys had played it or any Warhammer games before, but they were keen and fun guys to play with. I totally overwhelmed them with the rules and then we tried to play a game. As I had suspected... it went very slowly... We did get through one full round - during which there was a LOT of shooting and no close combat. 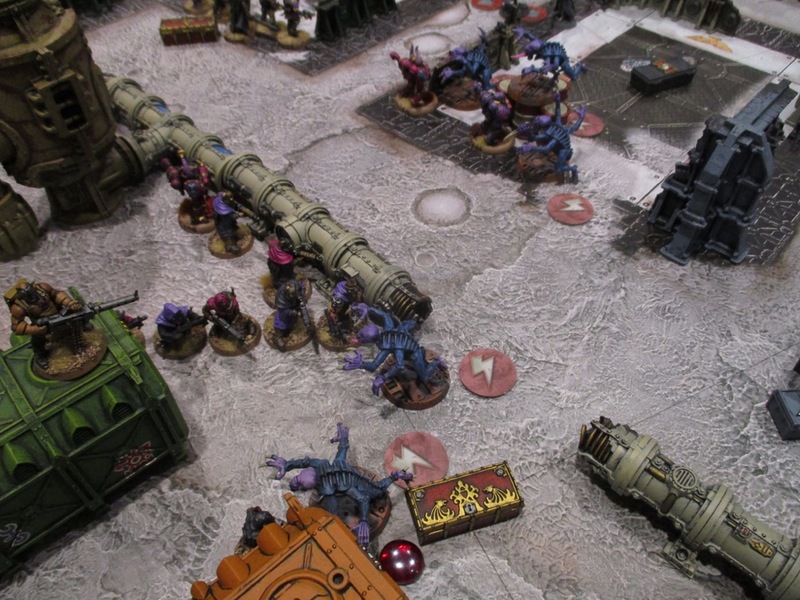 The Mechanicus mostly shot up the Drukhari and the Heretic Astartes shot up the Genestealers pretty good. We played PART of a second round. 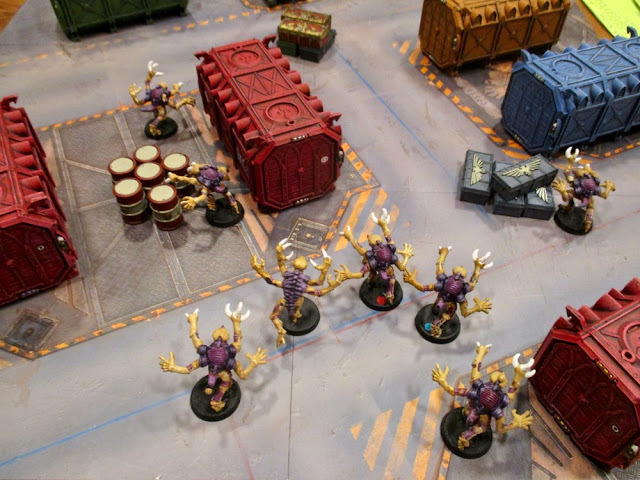 WE went through the movement phase and then I skipped straight to the fight phase (there wouldn't have been THAT much shooting anyway) because I wanted to give them all a sense of how the fight phase worked - and give the Drukhari and Genestealers a chance to do THEIR THING after having been mauled so badly by fire in the previous round. Hopefully everyone had a bit of fun and at least got a bit of a sense of how the game plays...? Now that I've got all this stuff painted, I'm looking forward to playing this for FUN - no longer under the pressure to get things ready for the demo and worrying about how it's going to go. 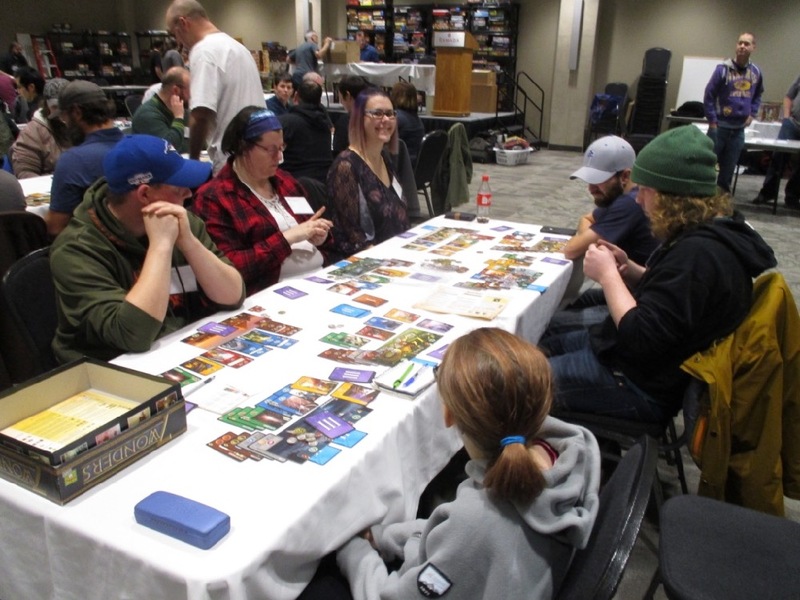 Shortly after the afternoon games was the auction... There are people that come to the convention just for the auction. 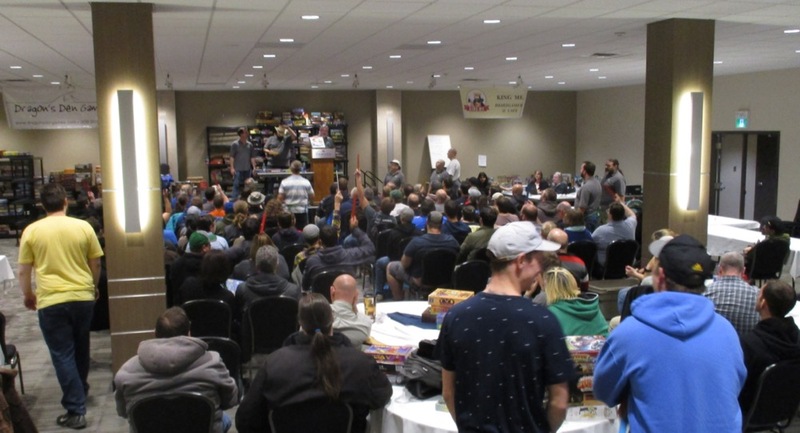 In just over two hours they auctioned off 344 games (THREE HUNDRED FOURTY FOUR!!!) 2-3 per minute... They're THAT fast! Every year I have a good look at all the games that will be up for action on Friday (or sometimes earlier if they post the list of games beforehand). Find the ones I'm genuinely interested in, check to see how much they cost new and what they're selling for used and then set a maximum I will bid and I STICK TO IT - When they are auctioning things off that fast it is SUPER easy to get carried away... I've seen used games sell for almost what they cost new!? I had about 20 games I planned to bid on a half dozen were ones I was genuinely interested in, others were more like "Well if I can get this for $5-10, I'll try it out..."
I won five lots. one was something that hadn't been on my list (the Dogs one) - When it came up, The Girl said she was interested in it. I don't like bidding on items I don't really know anything about, but I bid on it anyway and got it for about $16CAD. 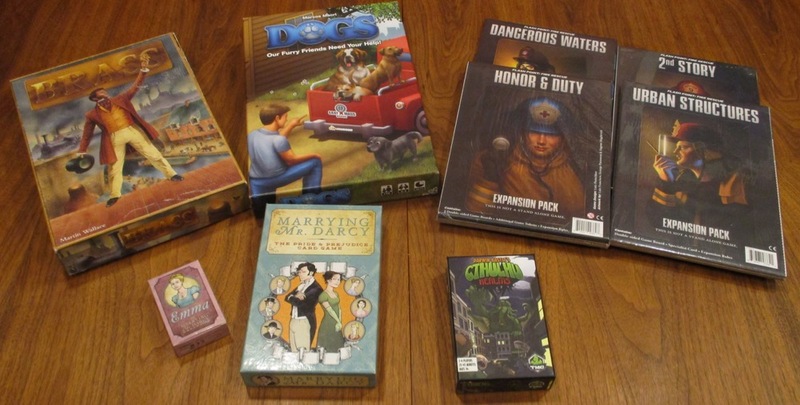 Looks like it goes for about $40-50 in the geek marketplace, so I think we did okay there... The four Flash Point expansions were all in one lot I picked up for $30CAD - this was another thing The Girl was interested in, but at least she pointed these out to me last night and I was able to look up how much they were new... Marrying Mr. Darcy came with the Emma and Undead Expansions. 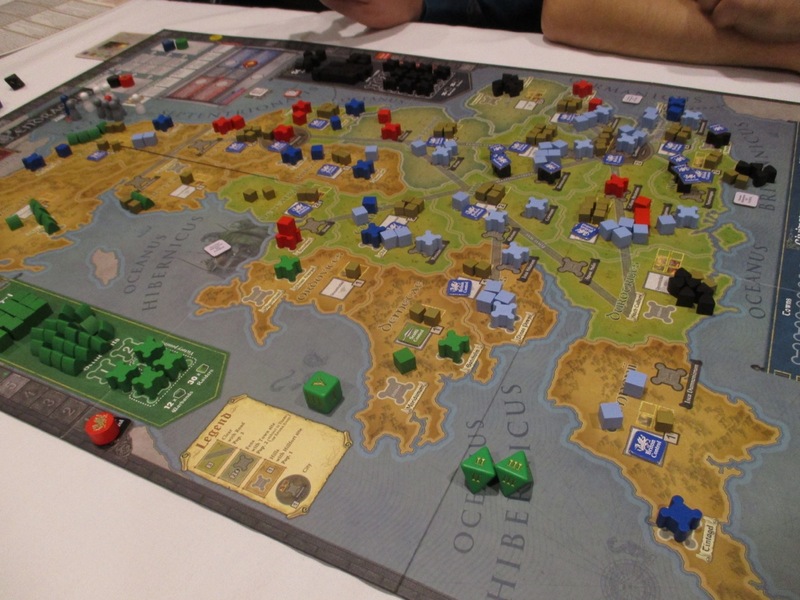 The older version of Brass I just about bought for $70 a year ago but managed to pick it up for $16 at the auction. One of these years I should probably offload a few games I know I'm never going to play again! We went home when the auction was done. There were a couple more sessions in the evening - Finnegan and I had signed up for Terraforming Mars and The Girl had signed up for Mission: Red Planet and Imhotep - but with so little sleep and having run a game, I was just DONE! 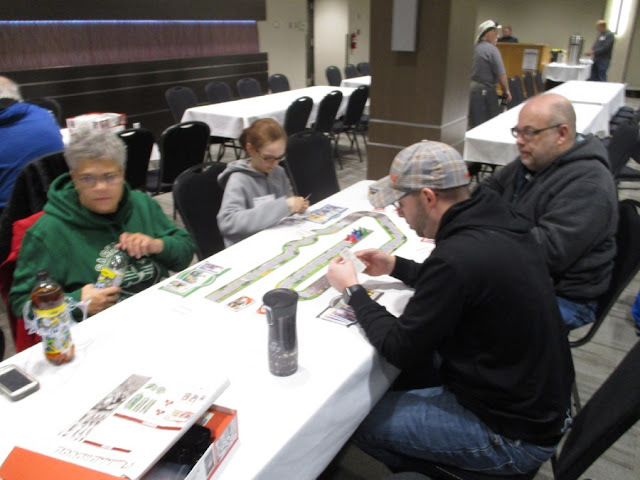 Sunday was different as we were all playing totally different games! The Girl started off with Flamme Rouge - a bicycle racing game. Pendragon seemed a little more straightforward than the others... But maybe it was the faction I was playing - the Scotti, of course!!! We kind of had to call it at some point because I had to go set up for the next game I was running. 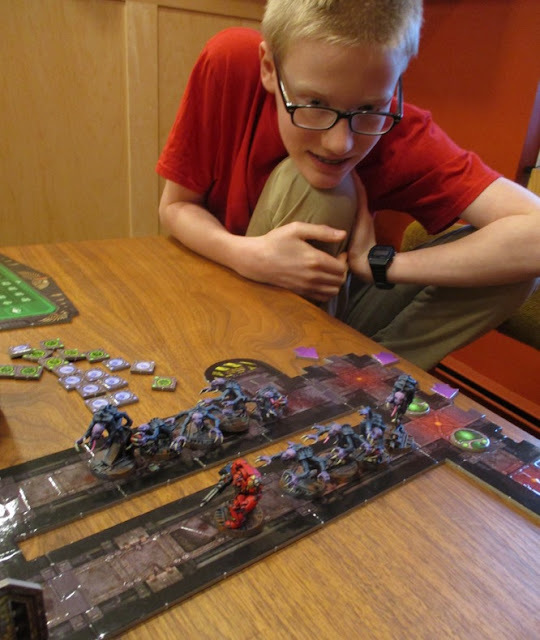 Finnegan decided this year he wanted to try out Twilight Imperium 4 - and he ended up playing that ALL DAY! 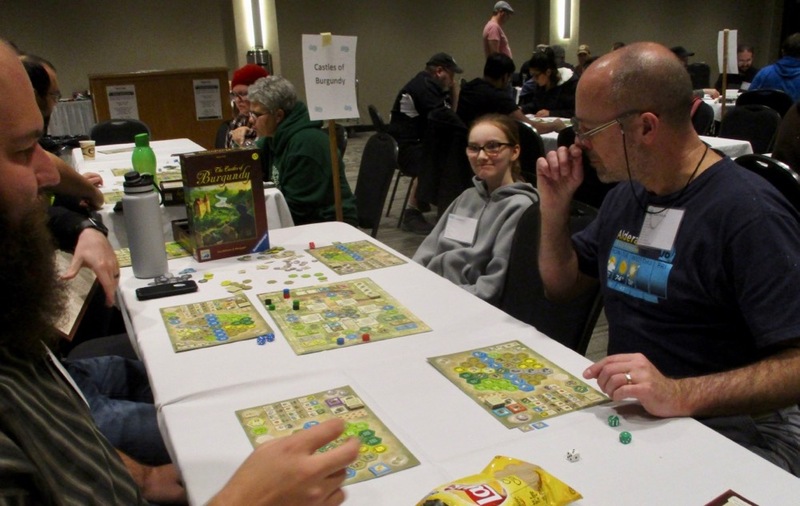 While I was still playing Pendragon, The Girl went and played Castles of Burgundy. 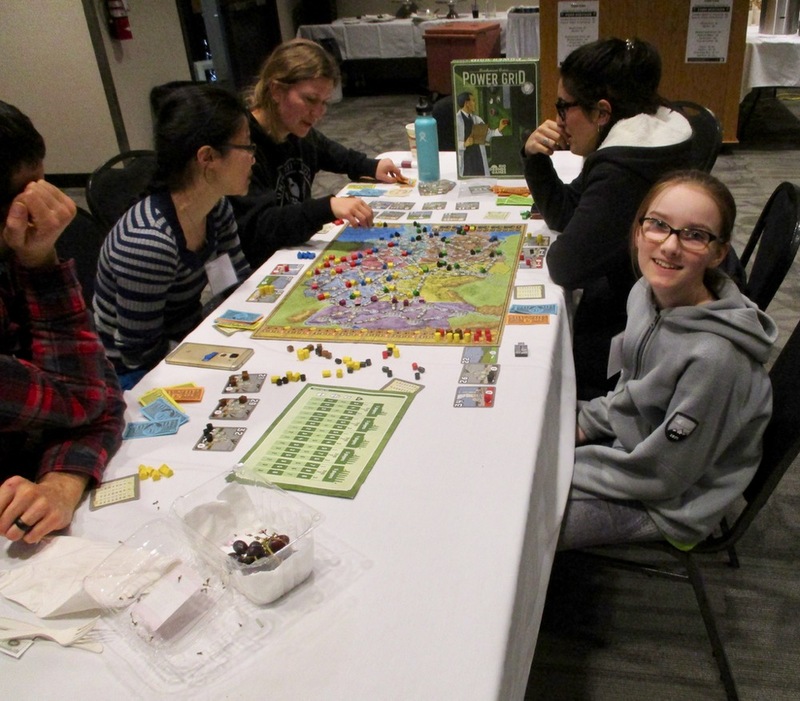 She's played it at ToonCon all three times she's come - she liked it so much the first time, she asked her grandma to get it for her for Xmas - and she got it... almost two years ago... and we have yet to play it at home!? 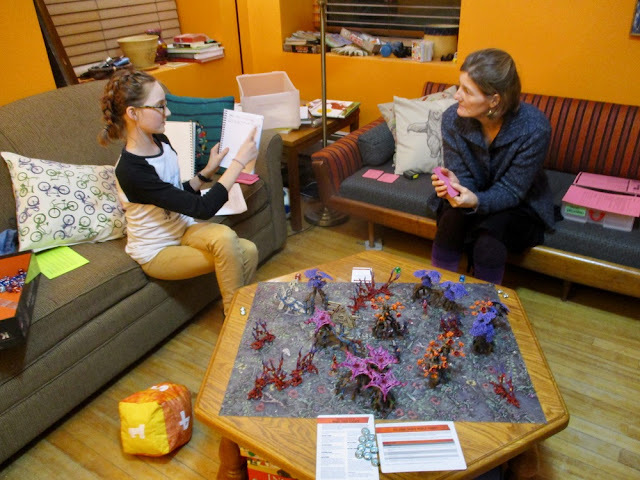 Hopefully we'll get it on the table soon while she's still got the rules all fresh in her head! 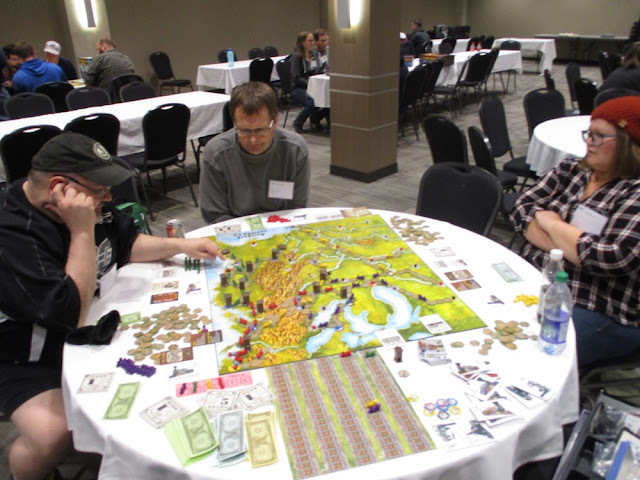 For the final session of the weekend, I set up a game of Railways of the World to run for a few people. Originally six were signed up, but only three of them showed up!? 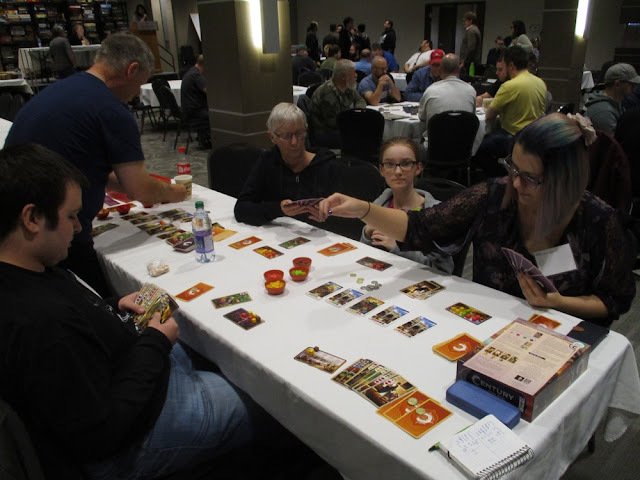 So I joined in, as it was a learn-to-play and I like to play and SHOW everyone what I'm doing and explain why. 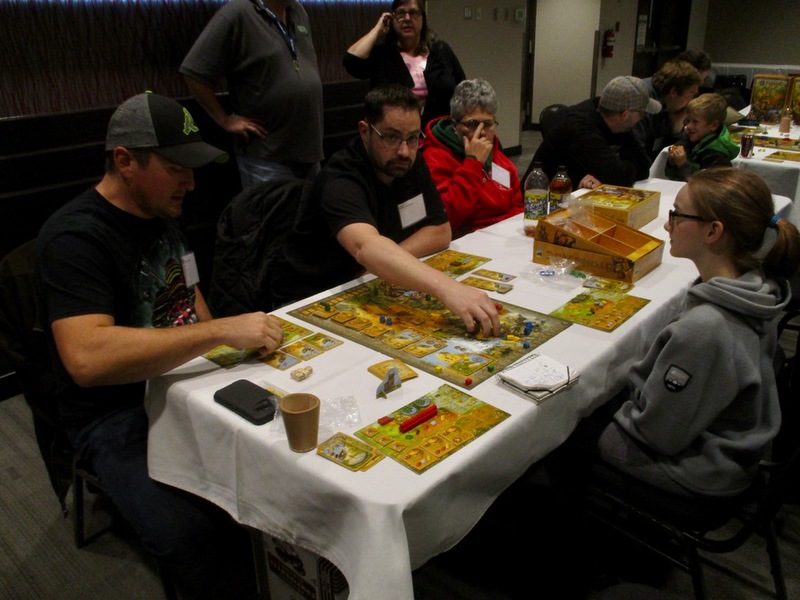 So all around I think everyone had quite a bit of fun and got excited about playing MORE games! 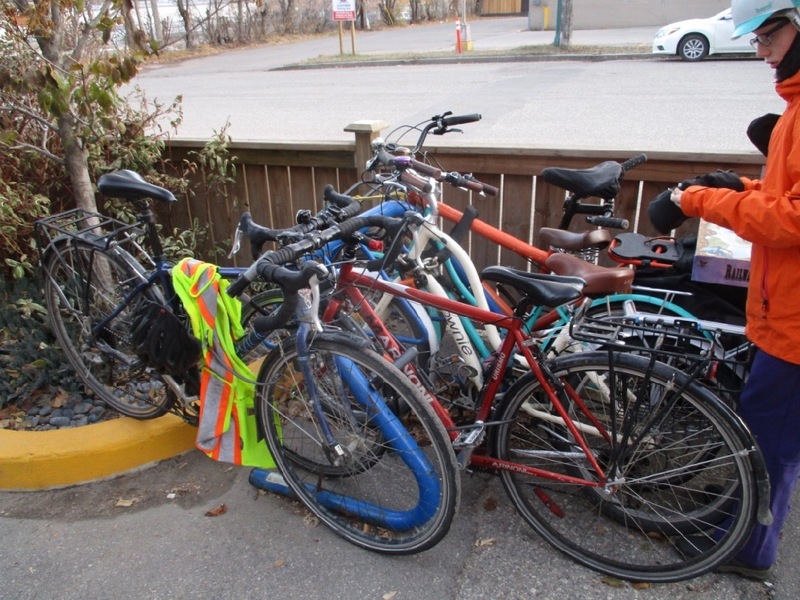 Bike parking was at a bit of a premium at the location - this was the only bike rack within blocks. It's kind of crammed into this little space between a fence, a planter and a spot to park a car. A Different guy had parked there with us on Friday evening and I think his bike might have been dinged by a car trying to pull in or out of that space!? Well... hard to say.. I've been so focused on getting ready for this past weekend for the last few months, I can't say I've given much thought to what comes next. Amanda would like me to clear out the basement so we can renovate the "Game Room". Surely that will be ONE of my priorities. I still have a lot of 40K and Kill Team stuff I'd like to get painted sooner rather than later.... 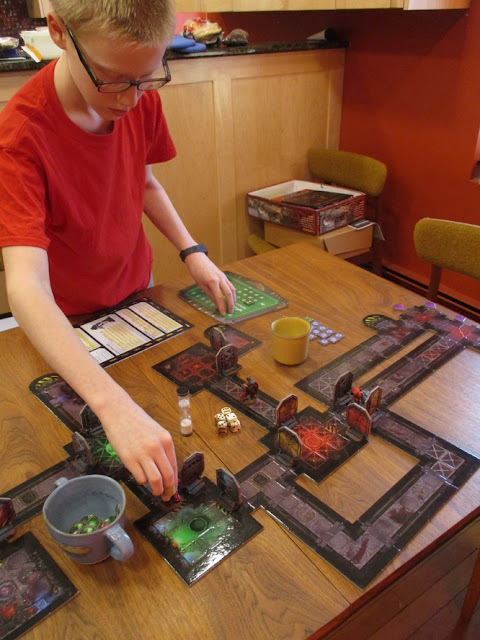 I wouldn't mind getting a Kill Team campaign underway - even if it's just with the family... and I wouldn't mind playing some OTHER games - now that the kids are super excited about.